Have you ever acquired a decorating book with projects so fancy you looked through it once, then set it quietly on the aspirational shelf? If the scene sounds familiar, but you still want to decorate like a pro, Julia M. Usher’s Ultimate Cookies may make all your cookie decorating dreams come true. This really is the ultimate decorating book, with projects handily designated as 1, 2 or 3 for complexity. Those of you with some decorating experience might head straight to the beautiful cookie jewel box or the adorable cookie purses, while decorating novices (or in my case, klutzes with terrible fine motor skills who still think they have a shot) can follow Julia’s step-by-step instructions for beginner techniques such as marbling. Yes, it will be a while before I master the jewel box, the three dimensional cookie animals, adorable cookie snow globes, spiders on webs or the snow men whose bodies are made of white macarons, but maybe one day. Until then, I will continue practicing and using Julia’s advice and recipes. Speaking of which, in Ultimate Cookies Julia shares her “Goof Proof” macaron recipe which I might try this weekend. Along with that are several other solid basics such as brownies, shortbread, ganache, royal icing and signature sugar cookies. And based on how good those sugar cookies were, I’d say the book is worth buying for that recipe alone. They really were terrific — light,crispy, flat and perfect for cutting and decorating. 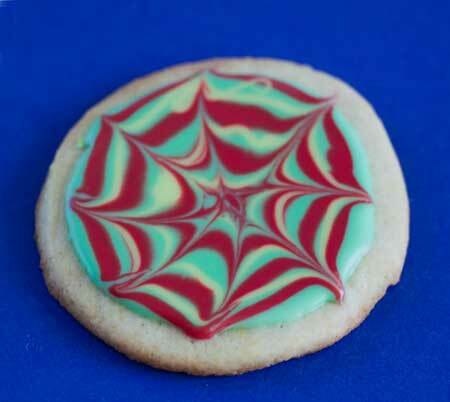 But there’s so much to offer here other than sugar cookies and royal icing. At the beginning of the book, Julia lists all the basic tools one would expect, but then she goes on to list what she calls “Bedazzlers” which include things such as a make-your-own cookie cutter kit, a pasta making machine, and even a printer with edible ink for making your own edible paper. This list goes on and on, with dozens more items you can buy to make dazzling, attention-getting cookies. And unlike the olden days when you’d read these books and wonder “where can I buy gold dust or wafer paper?”, Julia tells you exactly where to find those types of items which are, of course, one click away. In fact, she recently announced a partnership with Fancy Flours, a site I discovered a while back which has expanded my decorating horizons quite a bit. To sum it up, I’d say this is THE cookie decorating book for the 2011 holiday season and a perfect gift for bakers of all levels. 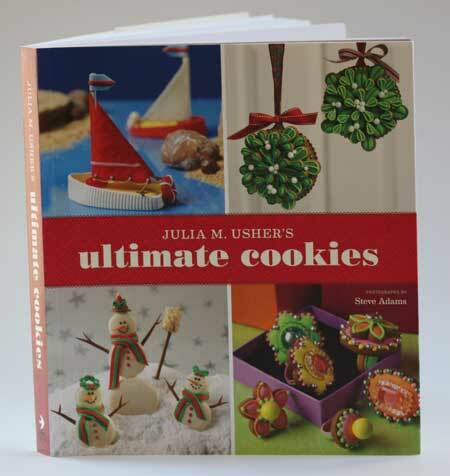 You can buy Ultimate Cookies on Amazon.com or read more about Julia Usher here. Elina, you should try edible paper! Maybe you’re a better decorator than I am, but I found the edible paper to be easier to use than royal icing. It really adds a nice touch. The book is thorough, but like you said — you just take a chunk of what you need to learn and start there. Great book review! I’d be more likely to buy this and give it as a gift. I’m simply not good at this kind of thing, but admire those who are. OTOH, after seeing the book in real life maybe I’ll have a hard time parting with it! Thanks so much for your support of my book with this lovely post. And, hey, you should give yourself more credit: your marbling technique looks pretty darn hot! Happy decorating!